A $2.5 million grant pushed by Gov. Rick Snyder was part of an effort to get Michigan in the game for luring commercial space businesses and all the money expected to come with them. Northern Michigan may yet join the space race. But Michigan taxpayers no longer are on the hook for a $2.5 million grant to develop a commercial launch site there, Bridge Magazine has learned. Gov. Gretchen Whitmer this week killed an under-the-radar effort to help develop a rocket-launching facility in Alpena, Gaylord or another city Up North. Personally backed by outgoing Gov. Rick Snyder, a Republican, the grant was approved by GOP lawmakers on one of his last days in office – even though specifics were limited to a two-page report aeronautical experts described to Bridge as a “back of the napkin” plan. The grant sought to add Michigan to the list of the states racing to tap into a growing commercial space market that major banks say could be worth $1 trillion to $3 trillion annually in a few decades. But details of the Michigan Launch Initiative were so scant that Whitmer’s administration won’t fund the project, said Kurt Weiss, a spokesman for the Department of Technology, Management and Budget. “We have no direction here,” Weiss told Bridge. The rocket proposal was perhaps the most unique among 75 pet projects, most sponsored by state Republican senators and representatives who used a $1.3 billion spending bill on Dec. 21 to tack on smaller grants to help fund infrastructure, health-care and cultural projects in their districts. Whitmer has blasted the spending as pork politics at its worst, and this week signaled the state is – at least temporarily – withholding funding for the most controversial of the ventures: $10 million to bring water and sewer lines to land in Salem Township owned by Schostak Brothers & Co., whose CEO, Bobby Schostak is a former chairman of the state Republican Party. Snyder did not return messages seeking comment from Bridge. The launch project was combined with a separate proposal to build hangars at Willow Run, a cargo airport in Wayne County, for repairing commercial aircraft. Gregory Behling, who wanted to develop the hangars, told Bridge his part of the project was slated to get $500,000 of the government grant, with the Michigan Launch Initiative getting the rest. Michigan lawmakers spread millions in pork. Did your town get a cut? The legislation did not make that clear, Weiss said, one of several deficiencies that doomed the grant. Weiss also noted the proposed launch program is in an undetermined area of northern Michigan and possibly in Macomb County, neither of which are mentioned in the legislation. Brown, contacted Wednesday, said his group had just learned about the grant’s problems. He said his group is trying to decide it’s next step and that he has met with Whitmer’s staff about the idea, which he said could mean billions of dollars for Michigan. “We still want to bring that opportunity forward,” he said Wednesday. In Michigan, that line stretches from the Old Mission Peninsula in Grand Traverse County on east to Alpena. The benefits: few people and lots of land. It would allow the launch of rockets that would place satellites in what’s called “low orbit” – up to roughly 1,000 miles above earth. Brown said he hoped to capture methane already released in Michigan to create those fuels, though he acknowledged a biofuel engine powerful enough to get into orbit has not yet been produced. His venture hoped to be launching rockets by 2022. Proponents across the country agree with Brown that developing an active spaceport would attract not just rockets and launches but also high-tech industries wanting to be near the facility. Jobs could number anywhere from 1,000 to as many as 8,000, Brown said. Before declining to fund the grant, state budget budget officials knew very little about it outside of a press release provided by Brown that claimed the $2.5 million in taxpayer money would help leverage another $70 million in private equity. Asked by Bridge if he could share more information, Brown declined, saying his group feared “copy cats” might try to take advantage of his business plan. Top academics at the University of Michigan’s aerospace engineering department said it might have been a blessing that Whitmer killed funding for the launch program. Anthony Waas, chairman of the department considered one of the best in the country, is wholeheartedly enthusiastic about Michigan joining the space race. But he labeled the Michigan Launch Initiative proposal a “back of the napkin” idea and was surprised Snyder had not reached out to U-M’s top scientists before greenlighting it. “We don’t know how the state can be talking about (a space program) without talking to us,” Waas said. That might sound like hubris, but Waas said university researchers are already leaders in developing small satellites and its engineers are working on all aspects of space. The university would gladly join a collaborative proposal to develop plans, he said. Spaceports have sprouted up across the country in anticipation of a commercial space boom, with Elon Musk’s SpaceX in California the most well known. Centers have been built in Oklahoma, Colorado, New Mexico and Texas, among others. Brown said he hopes to bring one to Michigan as well and touts the state’s many aerospace manufacturers, other engineers, ample and sparsely populated land as selling points. He also acknowledged the dangers – a rocket exploded during a 2015 launch off the Virginia coast – but said his group hope to develop rockets as safe as jet aircraft. The plan was to use the grant money to develop a “request for information” for northern Michigan communities – identifying how much land and infrastructure the launch initiative are looking for and using that to get more funding. State Rep. Triston Cole, R-Mancelona, said he is wildly supportive of bringing space-related jobs to northern Michigan. It would boost an economy that has been slipping for decades. “We’re a perfect spot for them,” Cole said. Northern Michigan economic development officials likewise would welcome the jobs and development, they told Bridge before the grant was killed. But they weren’t planning a ribbon-cutting just yet. Both McComb’s group and a similar one in Alpena have submitted letters of support for the launch initiative plan. In other states, the investments have come in the form of subsidies and direct investment ‒ New Mexico, for instance, pitched in over $200 million to build a spaceport ‒ in hopes of grabbing a sliver of the money pouring into commercial space projects. But with so many areas all chasing the same dream, the question is whether there will be enough business. In addition to competing with domestic launch sites, a number of countries are in the game as well. The rocket grant was one of five grants awarded during lame duck that the Whitmer administration has held up for fatal technical errors. A dam project in Gladwin County, a roads project in Muskegon Heights and a bridge project in St. Clair County were all scrapped because of the errors. Money for the Dearborn Heights Fire Department won’t be granted, either. Legislators cannot specifically name communities in legislation or the measure runs afoul of the state constitution. So the grants were written in language that is more general, even if they are intended for particular communities; such as by identifying cities or townships based on population rather than name. In each of the unfunded grants, there was an error in how the geography was defined, however. In Dearborn Heights’ case, the money was a for “a fire department located in a county with a population over 1,500,000 and in a city with a population between 98,000 and 99,000.” But that could only be Dearborn, not Dearborn Heights, which has about 57,000 people. The errors underscore criticism of lame-duck horsetrading: that there is not enough scrutiny given to rushed legislation. Because the grants were brought up on the last day of lame duck, there was no formal debate on them and most had never been reviewed by legislative committees. The new Legislature could choose to clean up the errors and re-appropriate the money, but then it would be up to Whitmer, a Democrat, to sign or veto projects supported by her Republican predecessor and approved by the GOP-dominated legislature. I'm glad Governor Whitmer killed this $2.5 Million grant funding for this private commercial business enterprise. Taxpayers hard-earned dollars should not be used to prop up private entities and enterprises through subsidies and grants, no matter whether they are supported either by Republicans or Democrats. Stop the abuse of the taxpayers hard earned money! Yeah, how dare they invest in jobs!! Invest in jobs? Like zero possibility. If a bank or venture capital fund doesn't want to support it then it's probably not viable. How about crowd funding it? I suspect they'd reject it! Great! Unfortunately she needs to save this so, judging from SOS, she can give even more out to others! This proposal had a couple of serious problems, even from the perspective of a non-rocket-scientist like myself. (1) There are physical, nonpolitical reasons why it's more desirable to launch rockets into orbit from points near the equator than from points near the poles. Because of the earth's rotation, places near the equator are moving faster than points near the north or south pole (which just spin in place.) Think of the difference in speed between the center and the outer edge of a spinning record turntable. Therefore rockets launched eastward from equatorial areas are a little easier to get into orbit since they have a head start in velocity. Here are a couple of websites that explain the concept. One of them includes, in the comments, an equation and a table showing just what the fuel and velocity requirements are from different latitudes, although I'll be honest enough to say that the equation itself is over my head. (2) You also have to think about what will be under an eastward-launching rocket when it discards spent rocket stages or fuel tanks, or if it malfunctions/explodes/crashes. At Cape Canaveral, there's thousands of miles of ocean in which stuff can fall down with little risk of hitting anything important. From Michigan, anything that fell back to earth after the relatively short period in which it could be ditched in Lake Huron would come crashing down in Ontario . I don't think our Canadian neighbors would be pleased. And that's not even addressing the likelihood of anyone developing successful methane-fueled rockets in the near future. Bovine excretions are a major source of methane -- is this a tipoff that the whole thing was a practical joke fueled by B.S.? $2.5 million is an absurdly low amount, and they would have just funneled the money to "studies" that cited your reasons for it not being feasible. A money grab that has now been cut off. Felix, you beat me to it. Rocket launches happen near the equator for a reason -- launching into the earth's rotation at the equator gives you a free ~1,000 mph of the 17,000 mph you need to get into Earth orbit, and every little bit helps. At the 45th parallel, it's 700 mph, which means you'd need to carry that much more fuel to get that extra 300 mph of speed. Not to mention, as you said, failed launches or spent stages that could crash into the ground in Ontario. Heads up, Sudbury! The Cape has ocean to the east, as does ESA/Ariane's launch site in South America, and space ranges in New Mexico and California empty deserts. Idiot republicans including the nerd from Ann Arbor don’t understand physics. The earth moves quicker at the equator so rocket launchers are cheaper closer to the equator. Just another crony capitalist pork project. Perfect examples of the problem of lame duck expenditures. These need to be banned. A lot of good reasons why this is a terrible idea (especially from Felix & Jo). Here's another one: It isn't Constitutional! Despite the fluff contained in her SOTS speech, could Gov. Whitmer actually know something about how government is supposed to operate? Or, will she shoot down that notion after she releases her budget in a few weeks? Clearly Cape Canaveral/ NASA put pressure on Whitmer. Launching rockets in Michigan is not without precedent. In the 1960s, NASA and University of Michigan’s Institute of Science and Technology sent rockets as high as 100 miles from a remote site at the eastern tip of the Kewenaw Peninsula known as the Kewenaw Rocket Range. Notice this undertaking was designed to bring jobs to northern Michigan. It reminds me of a similar such effort decades ago, that had the state establishing a ship-building plant in or near Ontonagon to construct barges that would carry railcars across Lake Michigan. At a cost of millions of dollars, this enterprise created many jobs in the Upper Peninsula, but the ship-building plant no longer exists for its intended purpose and there are no rail barges crossing Lake Michigan. Then there was the effort to save deer one winter by--if I recall correctly--the Munising Sportsmen's Club. This group offered to carry feed for free out to the nearby deer yards to be sure none of the game animals died. The association succeeded in this endeavor so well that the surplus deer ate much of the farmers' crops the following summer, requiring the herd to be thinned. Also, if my memory serves me well, the Munising Sportsmen's Club later billed the state for the cost of the members' gas and wear on their snowmobiles. And so it goes. 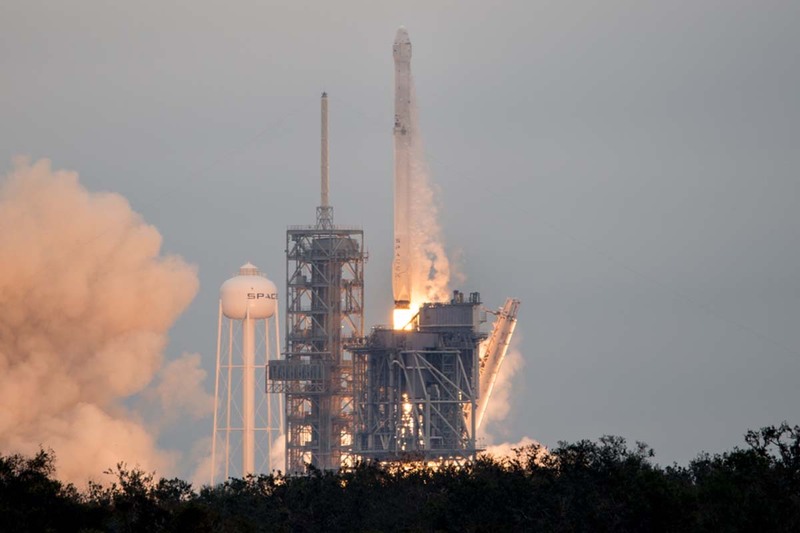 "a biofuel [methane] engine powerful enough to get into orbit has not yet been produced"
SpaceX has a production Raptor reusable methane engine on their Texas test stand now, and it starts low altitude flight tests in a few weeks. It's considered the most advanced engine in the world, and is destined to power their Starship Moon/Mars vehicle. Waas sounds unschooled in politics. The legislature providing spending for projects even if they don't know definitely what they're funding happens all the time. It's about giving free money to political allies, not value for tax dollars. Thank you Governor for taking this action against the Ricks Rockets. 'Crony capitalism' at its finest via the Michigan GOP. I'm pretty sure MEDC and SPARK got their cuts. It doesn't matter if it's DOA - some GOP buddy got some free taxpayer money. Michigan is an awful location for missile/space launch activities because of our frequent heavy cloud cover that interferes with proper visual launch vehicle monitoring. I would have an interest in an additional launch facility, possibly in Norther Michigan, that might support a 1000 g autonomous launch vehicle to support low Earth Orbit missions, to resupply, refuel, or rescue. Anyone have any suggestions on who to contact?